Please welcome Tina Connolly back to the blog! Here new YA novel, Seriously Wicked, just came out this month, and she kindly answered a few of my questions about it! Congrats on the new book! Will you tell us a little about Camellia and Seriously Wicked? Thank you! 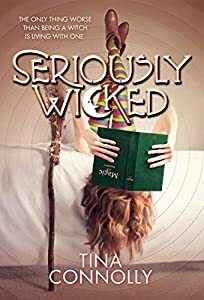 Seriously Wicked is a lighthearted story about a high school girl named Camellia who’s stuck living with a wicked witch. Things get complicated when the witch’s latest taking-over-the-world plan goes awry, and the demon she summons ends up in the cute new boy-band boy from school. Why do you think readers will root for Camellia? I like Cam because she’s kind and stubborn and always trying to do the right thing. A lifetime of doing the witch’s crazy chores like mucking out the dragon’s garage and procuring unicorn hairs means that she’s pretty self-confident and self-reliant. She may be in a bit over her head, but she’s going to try to stop the witch anyway. I also like that she owns up to her mistakes with her friends and tries to do better. Oh, my favorite supporting character is definitely sweet nerdy 4-H boy Kelvin. I love him to pieces, especially his Halloween costume. Wicked witch Sarmine is also a lot of fun to write (but of course she’s one of the antagonists!) I also love Cam’s best friend Jenah, who is super self-confident and knows everybody. Why did you decide to write a book for a younger audience? I actually wrote this book before Ironskin! (And then rewrote it and rewrote it.) I’m a big fan of funny YA and MG books and when the idea of an ordinary girl who lives with a wicked witch jumped into my head, the whole thing just poured out. It’s been a while since we caught up… Have you read any good books lately? So I’m working on Seriously #2, immediately followed by Seriously #3. Also I recently wrote a requested Seriously story about a disastrous witch pool party, so hopefully we’ll see that later this year. And I would say that’s it, only I know perfectly well that I’ve A) forgotten several things and B) will say “yes” to several more things, even though I should really get some more sleep. Thanks so much for having me on the blog, Kristin! Suddenly Cam’s got bigger problems than passing Algebra. Her friends are getting zombiefied. Their dragon is tired of hiding in the RV garage. For being a shy boy-band boy, Devon is sure kissing a bunch of girls. And a phoenix hidden in the school is going to explode on the night of the Halloween Dance. interview, Seriously Wicked, tina connolly.